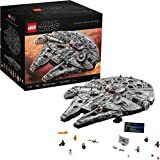 Sold by Ted's Toy Emporium and ships from Amazon Fulfillment. 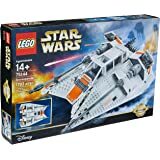 Own part of Star Wars history with the Y-Wing Starfighter. 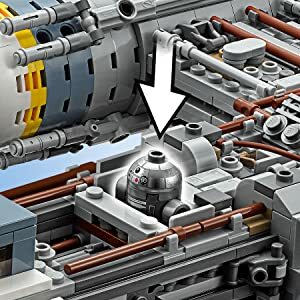 This LEGO Star Wars Ultimate Collector Series model has an amazing level of detail, including an opening minifigure cockpit for the included Gold Leader minifigure, wheel-activated rotating ion cannons on top, retractable landing skids and space for the R2-BHD astromech droid. 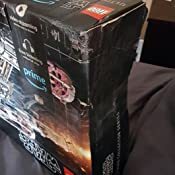 This fantastic Star Wars toy also comes with a tilting display stand and informational fact plaque, making it the perfect centerpiece for your collection. 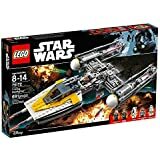 Build the ultimate Rebel starfighter! 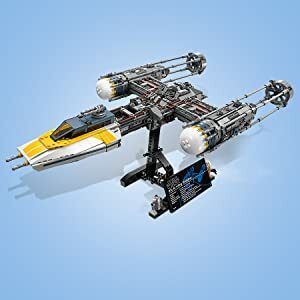 Add the Y-Wing to your LEGO Star Wars collection. 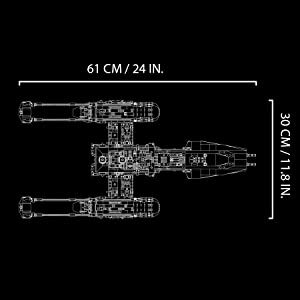 Capture the iconic look of this famous Star Wars vessel. 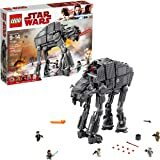 Great for play and display! Includes stand for showing off your model on your shelf. 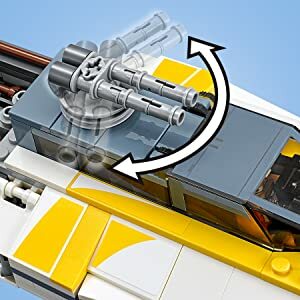 Rotate the ion cannons to fight off the enemy. Put the droid in place before launch. 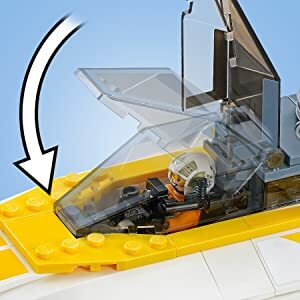 Operate the retractable landing skids. Open the cockpit, put the pilot inside, and you’re ready for battle. 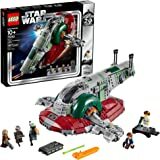 Includes Gold Leader minifigure and R2-BHD droid. Headline and pictures are self explanatory. I am a collector, and I value the original packaging of all items i collect, especially ones where i pay 200$+ on. This looks like something you'd find at some value village or something. 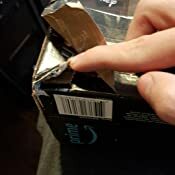 There were holes in the box, covered up by prime tape. As seen in the pictures. Why would you want your brand associated with such poor quality?? 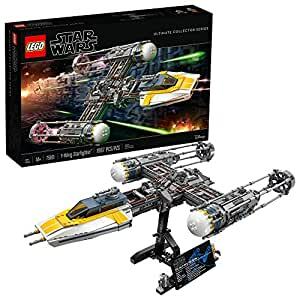 If you do not care about the original packaging of your UCS legos then by all means this product is for you, i am sure the lego itself is fine. But if you are like me and value the original packaging, avoid this like the plague! A free replacement is on its way, and i have to waste gas to return this. In all fairness i will change thus review to a higher one if the replacement one is better, otherwise the only reason why this gets 2 stars is for good service. 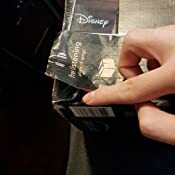 New set was given to me by amazon, this box was still damaged but not as badly. Overall fun build and nice looking piece. Excellent model, a classic to have. 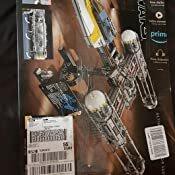 Not a challenging built, but interresting to do. Looks great on the stand with the description plate. 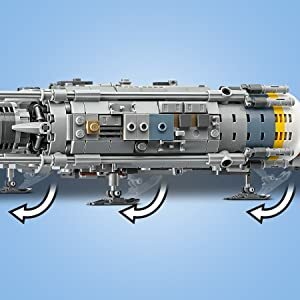 Kids can play with it, but there is a lot of small parts, adding to the detail of the ship, that could detach. This thing is probably the most meticulous Lego build I've done. It's insanely detailed and takes some doing to get assembled. Any detail junkies will have a hay day with this one, as it boasts tons of tiny pieces and intricate little details. A lot of fun to put together, but a lot of work as well. Also keep in mind, this thing's pretty huge (about 60cm x 30cm fully built). Much larger than I thought it'd be. Looks absolutely superb once it's done though! 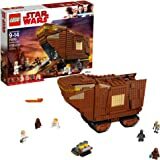 A lot of the collector's series sets I could see kids feasibly playing with, but this one's pretty heavy though; and has a lot of little surface bits that can come off and get lost pretty easily. Definitely more of a show-piece. 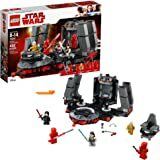 I like the build and the look of this set, and while it’s on the small side for the original price, I got a deal on Amazon and for what I paid, it was well worth it. Fun set to put together, final product looks fantastic. Disclaimer: I love Star Wars and Lego. Amazing attention to detail, love it!